A brilliantly absurd arcade brawler thats brimming with personality, but suffers from repetition and a glaring lack of online multiplayer. 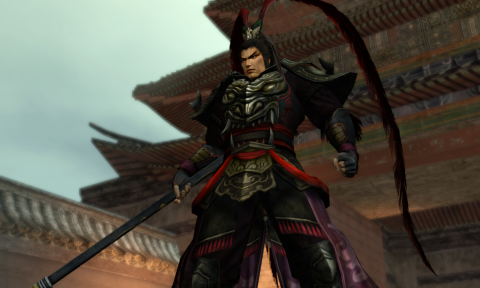 There are 82 playable characters in Dynasty Warriors 8, all of whom have their own ludicrously over-the-top special attacks, weapons and personalities. They're also based—very loosely—on real historical figures. Cao Cao can knock entire platoons of enemy soldiers off their feet with just a wave of his hand. Cai Wenji strums her harp to unleash a torrent of magical energy. Zhang Fei drinks wine to boost his attack and defence. Dong Zhuo throws bombs, and Zuo Ci fires purple lasers. This is the story of the unification of China, as told by Luo Guanzhong's Romance of the Three Kingdoms—a 14th Century novel that is partly truth, partly fiction. In the book, and the game, real events mingle with myth, and legendary heroes of the period—from evil warlord Lu Bu to emperor Sun Quan—are imagined as powerful supernatural beings, standing several feet taller than their troops and destroying whole armies single-handedly. It's ancient history meets the world's maddest anime. Hundreds of enemies appear on screen at once, but it doesn't take much effort to carve through them with your officer's weapon of choice, be it a sword, a giant hammer, a deck of enchanted tarot cards or a bazooka. Yeah, really. But while Dynasty Warriors is often unfairly written off as a mindless button-basher, basic combos won't get you past tougher enemies. To beat them you'll have to make use of blocking, counters and, of course, the series' trademark Musou attacks. Fill up your Musou meter and you can unleash a devastating, theatrical area-of-effect attack that wipes out scores of enemies in one fell swoop. They're all brilliantly animated and unique to each character. Lu Bu thrusts his halberd forward with a bolt of red lightning. Zhang Fei grabs an enemy by the legs, spins them around and tosses them across the battlefield. The resulting fountain of bodies from activating a Musou attack in a massive group of soldiers is incredibly satisfying. Battles take place across large, open maps. You'll always have a primary objective, like crushing a rebellion or storming a castle, but other opportunities will arise as you fight, like taking out siege weapons or clashing with a rival officer. AI drones fight alongside you, but it's really your own personal war. It's not a pretty game, with flat, lifeless environments and grubby low-res textures, but the sheer amount of enemies and pyrotechnics that fill the screen just about make up for it. Your weapons have one of three affinities—Heaven, Earth, or Man—and so do enemies. If you're facing an opponent with an affinity that clashes with your own, you'll be at a disadvantage and find it difficult to break their guard, but switch weapons mid-fight to a stronger affinity and you'll be able to strike them with a flurry of unstoppable attacks. It's basically an elaborate game of rock, paper, scissors. But one criticism of Dynasty Warriors I think is entirely justified is how repetitive it is. Your limited pool of abilities and moves is stretched far too thin. Battles can go on for as long as an hour, with the 'KO' counter at the bottom-right of the screen ticking up into the thousands. The appearance of 'boss' characters and objectives that can change suddenly—like rushing to the defence of an overwhelmed ally—try their best to break up the slog, but there isn't really that much to do. I had the most fun in story mode, which tells the story of the Three Kingdoms in the manner of a particularly melodramatic soap opera. The voice acting is terrible, but hilariously so, and the characters are all superbly overblown. Each faction has distinct stories, locations, heroes, villains and battles, or you can enter Free mode to play any stage with an officer of your choosing, regardless of their allegiance. There's a lot of game here, including the ability to customise and level up all 82 characters. This is a console game at heart, but Koei have done a decent job with the port. It looks dated even at max settings, but there's a good selection of graphics options available and support for modern resolutions—something a lot of Japanese ports seem to struggle with. But the most egregious omission is the lack of any online multiplayer on PC, despite it being available in the PlayStation versions. There's local co-op, but not being able to play with friends over Steam is a big letdown.